Editor’s note: This post comes from NOadventure repeat guest writer Whitney Mackman. 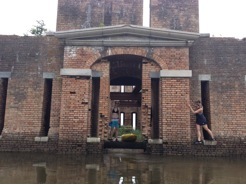 Fort Proctor is one that I’ve wanted to do for a long time. Looks like an awesome adventure! 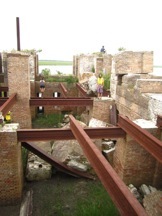 A friend of mine heard about Fort Proctor in St. Bernard Parish and instantly smelled adventure. 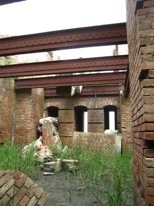 Fort Proctor is a wrecked 19th century fort on the shore of Lake Borgne. 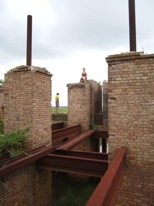 Barely an hour out of town, Fort Proctor used to be accessible by land but is now cut off by MR-GO. So, we headed to Shell Beach, LA to launch and cross the MRGO, traveled through Bayou Yscloskey, and entered Lake Borgne. 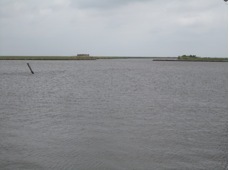 Once you cross the MRGO, you could essentially walk the shores of Bayou Yscolskey, but it’s more fun to explore in a boat (especially because of the wrecked pier I will discuss later). 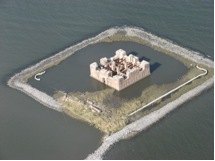 You can see the fort in the distance from Shell Beach as well as the entrance to Bayou Yscloskey. 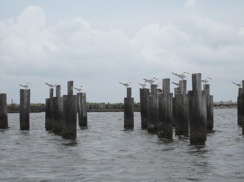 The pier is gone, but a highly photographed Katrina memorial stands a few feet out in the water. No map or GPS toys needed. Crossing MRGO was not as perilous as I had imagined. The current was almost non-existent, as was the wind. A fisherman on the beach told me he did the crossing in a good ol’ pirogue, so I didn’t worry too much after that. There were, however, small speed and fishing boats flying across it, but we kept our eyes open and our paddles way up in the air when we spotted a big boat. We encountered lots of slower fishing boats, but they saw us in time, respected our space, and gave us a wake to ride. The water crossing takes about 30 minutes if you don’t get distracted – and we had 9 people and 6 kayaks on this adventure. 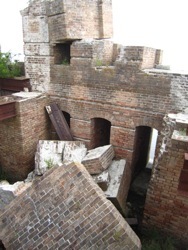 Once we crossed the “wall” there was nothing left to do but storm the fort! Well, we had to clear some massive spider webs away, but then we took over! We were warned there would be many, many snakes in this fort, but we didn’t see a single one, so we counted ourselves lucky. There was, however, a raccoon in a hole who caused quite a fright. He stayed in his hole though and didn’t give us any trouble. There’s a debris marsh to the right of the official entrance that will hold your kayak. Even if you don’t tie it up, it can’t leave the enclosed area around the fort. It is a small fort and you definitely don’t need to make this a day trip, but we did. We climbed around the brick and steel, testing our limits, daring ourselves to climb higher on the bricks or cross over on the beams. 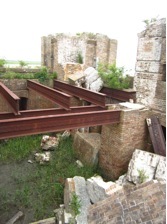 Some of the steel is corroded and not the best to step on, but most of the foundation of this fort is pretty sturdy. After about an hour of climbing every section, we had a snack and a beer and climbed some more. 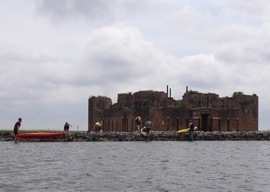 After climbing the fort to our hearts content we hauled the kayaks back over the wall and into Lake Borgne, across the mouth of Bayou Yscloskey, and into what’s left of a very alien pier. I don’t know how to describe this place but it’s eerie, with large, tumbled concrete cubes with openings that look like they will gobble you up. It’s definitely worth exploring and having a random picnic on a concrete platform. On the way back to MRGO we stopped on the shore of Bayou Yscloskey and went for a swim. I’m not sure I can recommend swimming and we had a few Louisiana locals with us who knew better. 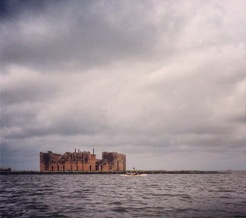 However, I’d definitely recommend this trip, especially if you have your own kayaks. 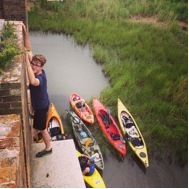 Where did you put in the kayaks in Shell Beach? I’ve never been there before but I think after reading this, you have just given me an excuse to head south and explore the fort for myself. Thanks. Put in at Blackie Campo’s Marina. watch out for the raccoon! definitely worth an excursion. very informative article. keep up the good work! Take Florissant hwy (46), quick left turn onto Hopedale Hwy (624), then go right on Ysclosky Hwy (46) and follow to Campo’s Marina at Shell Beach. Plenty of parking and a place to launch. I just did this on thursday with friends. i’ve been wanting to go since i read this post. we went with 4 people, 3 in a canoe and 1 in a kayak. it was windy when we set out so i was nervous about coming back, but it wasn’t that hard, and mrgo is easier to cross than expected. a real cool adventure with a dolphin in mrgo at our return, and the drunk oystermen reeling about in the roads loading the trucks late afternoon. we didn’t see the raccoon, but its tracks, and no snakes. just a TON of mud, so watch out for your flip flops. good times! so glad i saw this post and went for it! Sorry this post is over a year late, but I’m glad this inspired adventure Jessica! Also. I’m glad there were no snakes! Keep exploring and let us know if you have any awesome adventures in the works.